I will admit that I do take a vitamin supplement every day. I take a capsule that contains evening primrose oil and some vitamins that are supposed to be good for my hair and nails as well as my skin. I started taking it because I have a tendency to get eczema and was told it might help. To be honest, I'm still not sure that it does, but I carry on taking it anyway - as well as using a cream prescribed by my GP. But that's my personal history with taking vitamins. I was recently sent the results of a survey into the nation’s attitude towards health, undertaken on behalf of a company that sells supplements. The survey revealed that while 38 per cent of us describe ourselves as ‘fairly health conscious’, the nation's knowledge of what techniques and habits can improve our health is sometimes wrong. The study, conducted by Simply Supplements, asked over 2,000 Brits to identify what improvements they could make to their lives in order to improve their health. The respondents could choose multiple options, 24 per cent chose 'Increase fresh air intake' and 27 per cent picked 'Thinking positively'. 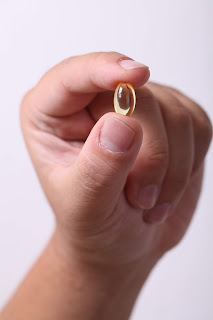 A mere 19 per cent selected taking daily supplements to top up vitamins needed by the body. The study also appears to have exposed a big gap in some people's knowledge. This is shown in almost half the population (46 per cent) not understanding that eating healthy balanced meals would improve their overall health, less than a third (29 per cent) realising that decreasing alcohol intake would improve their overall health, and 5 per cent mistakenly believing that arsenic was something they should be taking daily. Arsenic occurs naturally in the earth, and at low levels is harmless. However, when consumed over a long period of time, it can lead to adverse effects on the stomach and liver. This pales in comparison to 4 per cent believing that radioactive isotope polonium would improve health if consumed, when in actual fact would give you metal poisoning, liver damage, followed by death. The company behind the survey, Simply Supplements, said if you do want to get healthier, the impact a healthy diet can have on the body is wide-ranging, from increased alertness, improved sleep, and reduced risk of heart disease. Having a balanced diet gives the body all the nutrients it needs, meaning we have enough energy without excess calories being stored as fat. The company also said that taking daily vitamin supplements can be beneficial. Matt Durkin MSc, a nutritionist from Simply Supplements, said: "According to recent research by the British Nutrition Foundation, almost 25 per cent of adult men and nearly 50 per cent of adult females are believed to have insufficient levels of selenium. Selenium is a crucial nutrient for the creation of glutathione in the body, more commonly known to nutritionists as the ‘master antioxidant’. Similarly, around a third of females between the ages of 11 and 64 have an insufficient intake of iron, which is an important mineral for cognitive function and energy levels. As a result, it is therefore quite worrying that such low numbers of Brits identify supplements as an effective method of supporting good health." Now, I am no health or diet professional, and I'm not offering this blog post - or the press release that the survey and quotes came from - as advice. I'm putting it up here as a matter of interest and possible discussion only. Over the years I have tried loads of differnt " health suppliements " , mostly after being told by friends " you really need to be taking this it's great" , but do think positive thinking must help. I'm sure having a positive attitude helps one keep on track with all the other things, like healthy eating, reducing alcohol consumption, and exercise. It is so much more difficult to eat healthily when you are feeling down. I was appalled - the current belief system sounds like something from the Middle Ages. I take a multi-vit from a reputable company plus herbal/plant supplements for my arthritis (Celadrin)and Milk Thistle (to be rid of toxins, I am a moderate before-dinner drinker/cook). If people ate properly they would absorb most of the vitamins and minerals their bodies required. Overdoing items (such as bingeing on Brazil nuts which are sources of Selenium) and supplementation, could cause health problems. I am horrified about arsenic - are you sure this isn't aspirin that people think should be taken on a regular basis? Arsenic used to be used in medicines. However, I quote from the Internet: "As documented in the mid-1800s, mountaineers of central Austria (Styria) made a habit of consuming arsenic preparations once or twice a week as a general stimulant and tonic. They became known as "arsenic eaters," and some were reputed to have adopted the practice as a means of building up a tolerance against poisoning by their enemies. The acquisition of a modest degree of tolerance has, in fact, been documented in laboratory animals, but its physiological basis is not clear". It was originally used in medications for parasites/bacteria but later became known as a TONIC which was marketed as Fowler's Solution and used in the Victorian period. By the middle of the 20c it appears to have been thought to be good for psoriasis but by then the penny was dropping as to its toxicity. My grandmother was a Victorian and handed down a few queer medical "tips" through my mother but luckily I am better educated than they were! I do follow all the "fads" intellectually from my interest in herbs but it is all very contradictory and a victim of fashion which is quickly seized upon by marketing companies. I was appalled by people not recognising the names of poisons too! I didn't conduct the research - the info came from the supplement company I mentioned and was in the form of a press release. Obviously they supplement firm was using it to promote their products, but I tried to take out the stuff that was over-advertisingy from the press release and just stick to what they said were the findings.